Glam design is where luxury meets sophistication in a glitzy decor scheme that seduces the senses. Mirrored furniture, rich fabrics, and metallic accents combine to create a look that plays on the extravagant. Chandeliers with cascades of crystals glitter against tufted furniture draped with faux furs. If “j’adore decor” is forever on your lips, then read on for more Glam room ideas. While Glam decor boasts bold themes and tempting textures, the color palette is a practice in restraint and sophistication. Gold and silver play a prominent role in the surfaces and fixtures that take on a gilded finish. Soft pinks and shades of white complement hard metallics while smooth greys and creamy neutrals create the base of this elegant look. Reflective surfaces infuse your space with glamour. Use mirrored furniture to add depth and shine to the room. Mirrored accent tables, desks, and coffee tables create a multi-layered look that’s both chic and sophisticated. 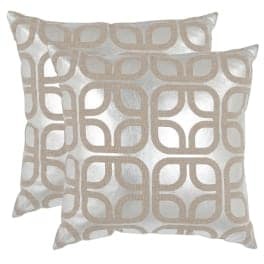 Decorative accents in gold or silver add a rich, opulent touch to the design. Warm, yellow gold is the perfect contrast to neutral furniture, while bright silver highlights the room with subtle luster. Give your Glam space luxe appeal with faux fur throws draped over sofas, chairs, and beds. 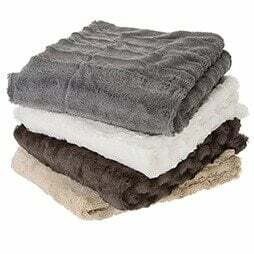 Soft and sensuous, faux fur plays on tactile senses to encourage relaxation and inspire comfort. 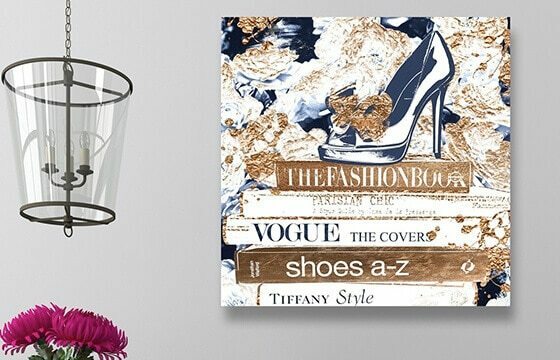 Create a distinct look with unique decorative pieces that reflect your sense of style. Decorative sculptures, geometric accents, and funky figurines are a great way to put your personality on display. Achieving a gorgeous Glam look is all in the details. Comfort and elegance are in harmony with stylish decor and luxurious furniture that draws you into this alluring atmosphere. 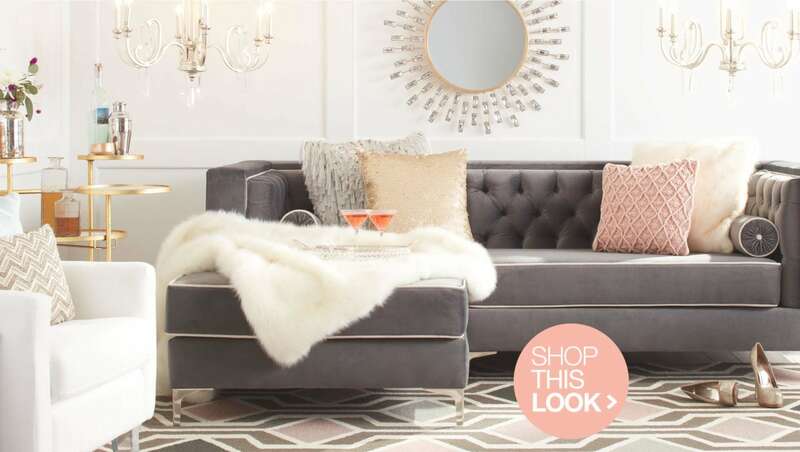 A tufted sofa layered with decorative throw pillows and faux fur sets the mood of this glamorous style. 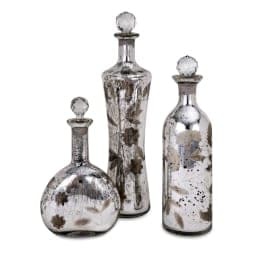 Tucked in are a few elements of sparkle, a bold print, and chic vases filled with fresh flowers. While femininity plays a prominent role in this design scheme, sophistication ultimately reigns supreme. Achieving a gorgeous Glam look is all in the details. 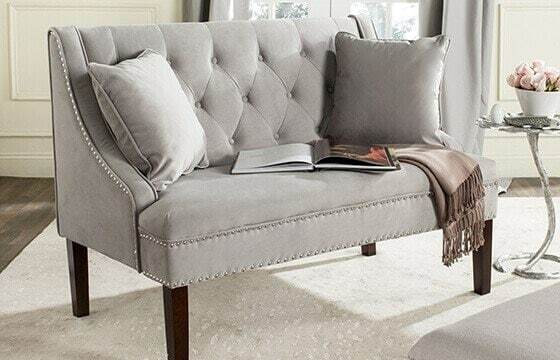 Glam sofas are the essence of luxury. Deep tufting, rich fabrics, nailhead trim, and rolled arms are characteristics that make a sofa the statement piece of a Glam living room. Whether neutral or boldly dyed, look for a sofa that speaks to your taste. 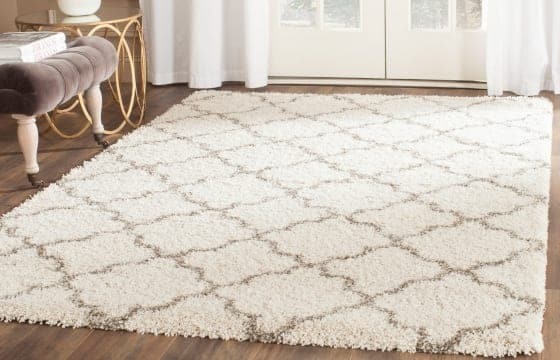 While often an underestimated decor element, rugs are an important part of a Glam living room. Bold patterns, vivid colors, luxurious materials, and shag piles lend a glamorous edge to your space. 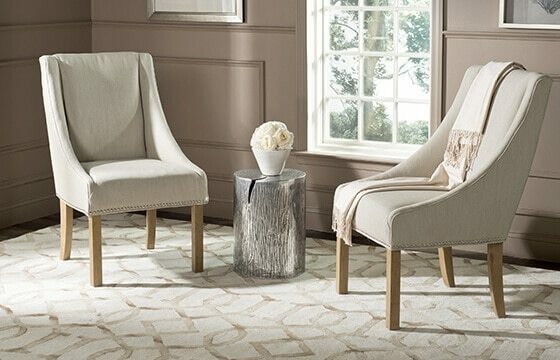 Take your furniture and decor into consideration before deciding on the perfect rug. 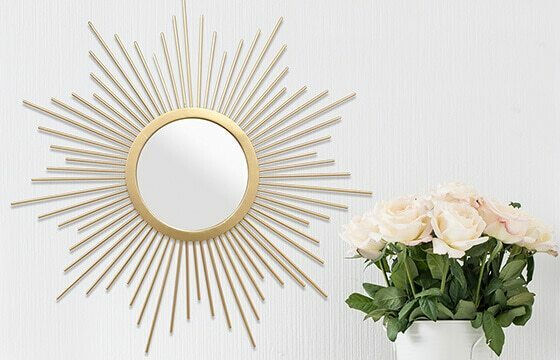 Finish your space with an attention-grabbing wall mirror. This showstopper is the perfect way to infuse your space with Glam style. 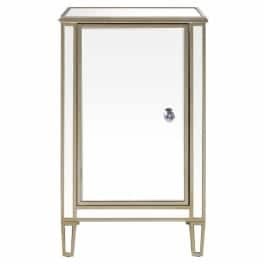 Look for a mirror that boasts a bold, eye-catching shape like a sunburst frame with crystal details. Glam style draws on elements from Mid-Century Modern and Hollywood Regency, and both styles embrace an attractive cocktail station. 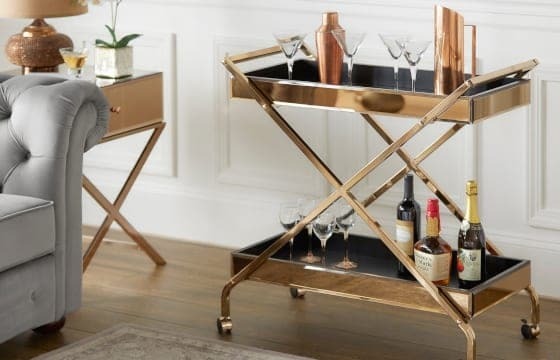 Whether you enjoy sipping a martini or prefer a Shirley Temple, you can create a fabulous bar cart with all of your favorite barware on display. A Glam dining table shines as the center of your dining room. A Glam dining table shines as the center of your dining room. Glittering with a sparkly center piece, gold-trimmed place settings, and crystal stemware, this dining room is destined for dinner parties and cocktail celebrations. A neutral table serves as the base of the design that is contrasted with mercury glass vases, gold-finished flatware, and beautiful fresh flowers. Tall tapers add height to the table, and modern dining chairs add the final punctuation to the look. A shimmering chandelier sets the mood of a Glam dining room. 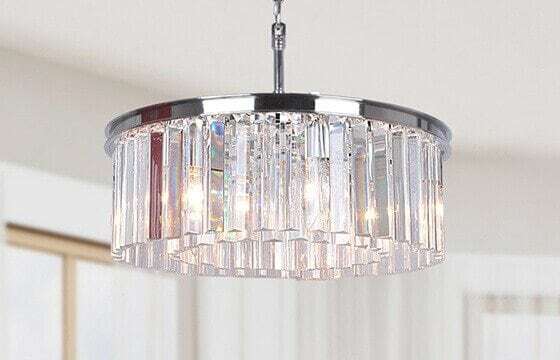 Whether dripping with crystals or embellished with candelabras, a dramatic chandelier is essential to a glamorous dining experience. Use a light dimmer to really set the tone of the room. Create a clean, stylized centerpiece using a few key components. 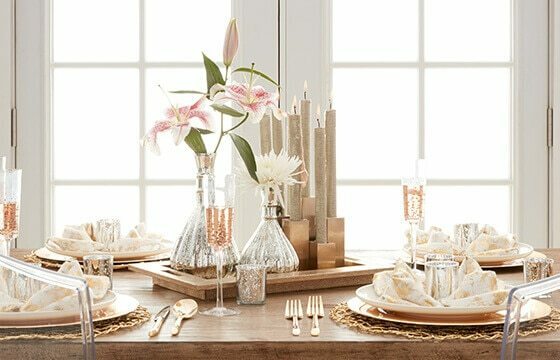 Since the table is decorated with bold dinnerware, complement the look with subtle details that pack a design punch like mercury glass vases with fresh flowers, metallic tapers, and a stylish tray to keep the look interesting yet understated. Up your Glam factor with gilded dinnerware that will dress up any table. 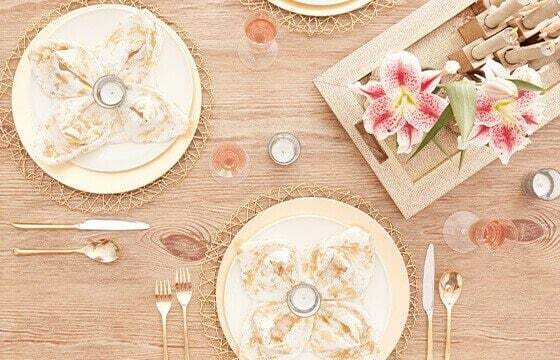 Start with metallic placemats in gold, silver, or copper and then layer on neutral dinnerware. Go for gold or copper flatware to add a bold touch to the look. Top off the design with beautiful table linens. Give your dining space a distinctly Glam touch with sleek, modern dining chairs. Mix white and gold molded plastic chairs with stunning transparent accent chairs to create a chic look that is anything but subtle. For added flair, toss a few gold accent pillows or a faux fur throw on each seat to pump up the style. A Glam bedroom emphasizes the relationship between haute style and luxe comfort. The dreamy color palette and layers of soft bedding make this elegant bedroom fit for a star. Drawing on the over-the-top elegance of old Hollywood, this posh style plays up the contemporary comforts of a modern bedroom. From bedding to wall decor, a Glam boudoir is the perfect place to unwind in sheer comfort. A Glam bedroom emphasizes the relationship between haute style and luxe comfort. From tufted sleigh beds to gilded metal frames, a Glam bed makes a stylish statement. Fabric headboards with deep tufting add drama to the room. Metal bedframes in bronze, gold, or copper finishes keep the look sleek yet glamorous. 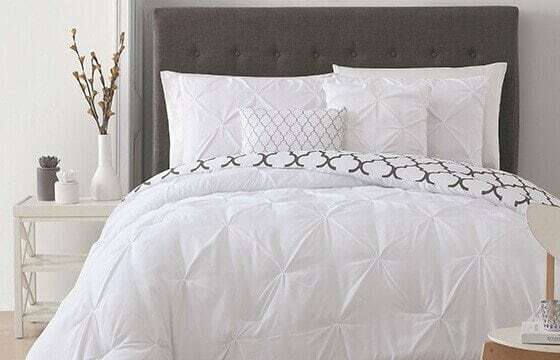 Go for luxurious fabrics and a down duvet to achieve a lavish look and feel. Add decorative throw pillows to create a layered look then toss on a faux fur blanket to add extra sass. Don’t forget the walls when decorating your Glam boudoir. Eye-catching wall art like black and white prints or bold paintings is the perfect touch to elevate your decor from drab to fab. Wall mirrors are another great way to accentuate your decor and make your room appear larger. Illuminate your bedroom with table lamps that stand out as their own statement piece. Bold shapes and glitzy finishes will give your Glam bedroom the best of form and function.